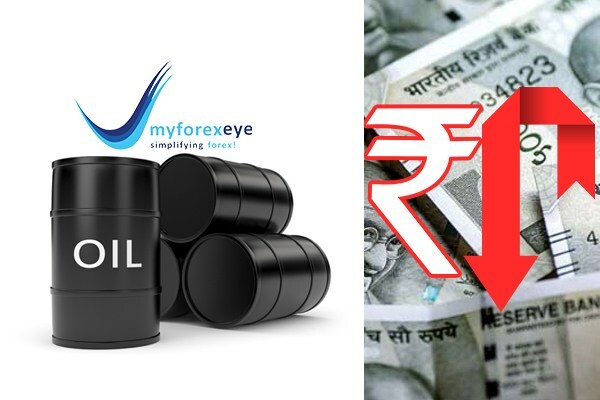 The Indian rupee remained lower against the dollar in afternoon trade, on increased greenback purchases by importers as the benchmark Brent crude price surged above $64, while upbeat U.S. inflation data also boosted dollar demand. The rupee changed hands at 70.90 to a dollar, against 70.7950 at previous close. The currency opened at 70.87 and extended losses to 71.00 in early trade. It briefly turned higher to 70.80 on likely dollar inflows, before resuming decline. Indian shares fell on Thursday, led by energy stocks after crude oil prices climbed to their highest in nearly three months. The broader NSE index declined 0.57% to 10,732.20, while the benchmark BSE index was 0.48% lower at 35,862.12. Asian markets are lower today. The Hang Seng fell 0.29% while Shanghai Composite was down 0.05% and Japan's Nikkei 225 was down 0.02%. European markets are higher today. The FTSE 100 was up 0.36%, the CAC 40 gained 0.96% while the DAX was up 0.81% and IBEX gained 0.57%. The benchmark Brent crude oil price was trading 1.13% higher at $64.33 per barrel, its highest in nearly three months and heading for its third straight session of gains on optimism over resolution of trade issues between the U.S. and China. Oil prices were also supported as Saudi Arabia said it will cut output further in coming months, while U.S. sanctions against Iran and Venezuela may further lead to supply reduction. The dollar index climbed 0.4% and was last trading little changed at 97.05, as data showed core inflation in the U.S. rose faster than expected. The index was also supported by weaker-than-expected December Eurozone industrial production data, which pushed the euro to near three-month lows to the dollar. A trade delegation led by Treasury Secretary Steven Mnuchin and U.S. Trade Representative Robert Lighthizer began high-level talks with Chinese counterparts, led by Vice Premier Liu He, today.